We got to Cusco two days early but already super excited for our big trekking excursion to Machu Picchu. Thus, before we started, we spent some relaxing time in this once so important Inka city, mingling with all the other tourists which crowd the streets and markets here, stocking up our already way too full backpacks with some cozy alpaca sweaters and other souvenirs we could not resist to buy. As the Inca trail, the most famous route to Machu Picchu, was booked out months ahead before we even knew when we would be in Peru, we chose an alternative trek to the long lost city of the Incas: the Salkantay trail. This trek, just like the Inca trail, is part of the giant trail network the Incas built back in the day to connect the various parts of their empire. It is possible to hike it without a guide, but we decided to spoil ourselves a bit and thus opted for an organized tour. This turned out to have been a great decision, because that way we not only had the most amazing group to hike with, but also probably one of Peru’s best cooks to prepare delicious meals for us. Furthermore, we had a herd of mules, donkeys and horses carrying all our food and tents and could enjoy this four day hike with less baggage and more energy for enjoying the stunning scenery. The trail started in Mollepata, just three hours outside Cusco, and ended at the entrance of Machu Picchu National Park from where a train took us to Aguas Calientes, the main base for almost everyone going to Machu Picchu. During these days we hiked up to heights of 4650m above sea level, passing by mighty glaciers and crystal clear lagoons and later descended down through lush rainforests while munching delicious passion fruits. On the fourth evening of our excursion, we eventually arrived in Aguas Calientes where we could rest our tired feet as well as the rest of our bodies in a bed instead of a tent again. Aguas Calientes is probably the most touristy town in all of South America with not much to see and do, however, it is also the place where we had the so far best Pisco Sours, Peru’s signature drink made mainly of Pisco (a grape liquor), sugar syrup and limes. Thus, we were super relaxed and refreshed the next morning when we hopped on a bus that took us up to the entrance to Machu Picchu. When we got there, thick fog was covering all the ruins still. This added lots to the mysteriousness of the place, however, it also prevented us from seeing much. Luckily though, soon the fog started lifting and Machu Picchu was revealed to us in all its beauty. Our day here was not only impressive but also quite intense: first we only strolled through all the ruins, but then we hiked up loads and loads of steep steps to the top of Huayna Picchu (the hill which is depicted in most illustrations of Machu Picchu) to get a bird’s eye perspective of the whole area. To top it all off we went to see the more famous than spectacular Inca bridge before we walked back down to Aguas Calientes where a delicious Creole lunch (Peruvian cuisine) was waiting for us. Later that day, exhausted but happy, we boarded a train which took us back to Cusco where we had a few days more to recover and plan out the rest of our time in Peru. Where to sleep: The Hostel Nueva Alta is run by the sweetest Peruvian family, has mostly tiny rooms but for cheap prizes. Also it is kept super tidy and it is centrally located. Where to eat and drink: We mostly ate at the local market, where tasty “menus” cost about a bit more than 1 Euro. If you want something a bit nicer, try the Pikanteria La Cusquenita, we had a great lunch there once. What to do: Stroll around town, there is a myriad of churches and museums to see, but alone visiting the local market is entertaining enough for quite some hours. 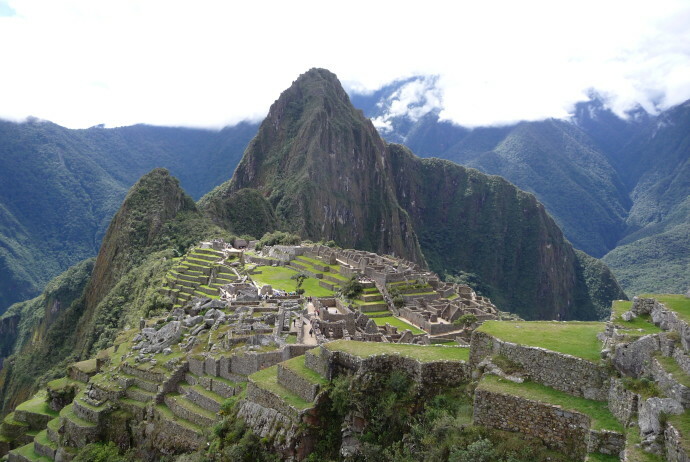 Of course also book a tour to go see Machu Picchu! Beautiful site, wish I were there to enjoy all!! !